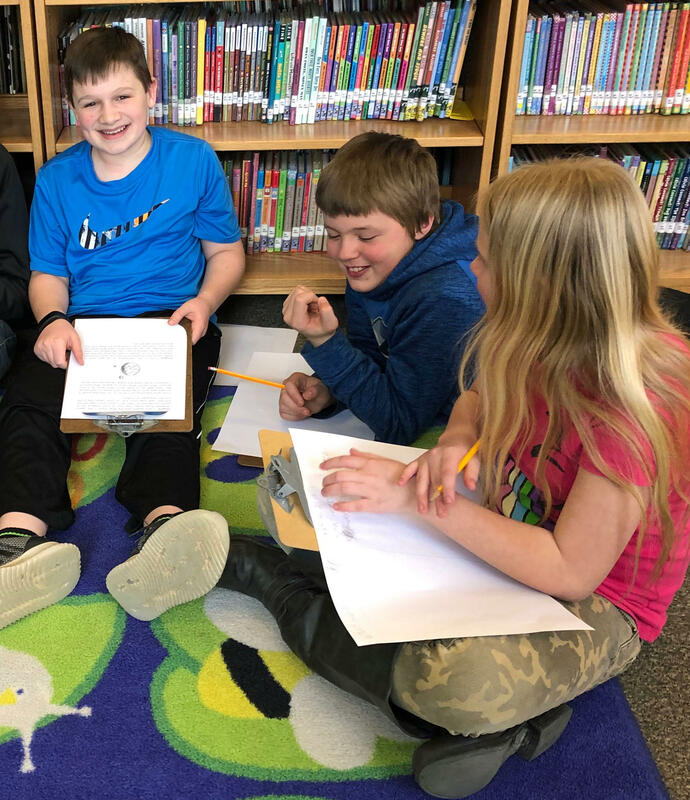 A group of students at Lothrop School in Pittsford discussed Kevin Emerson's "Last Day On Mars" - a nominee for the Dorothy Canfield Fisher Book Award and the first book in a series called Chronicle of the Dark Star. The novel is the first book in a science fiction trilogy called Chronicle of the Dark Star, and it is set in earth year 2213 — however Earth the planet doesn’t exist. The book explains that before Earth was burned up by the sun, the human race fled to colonize Mars. But Mars is now also on the brink of destruction, and humans are leaving Mars for a new home across the galaxy. It is one of the books nominated for the Dorothy Canfield Fisher Book Award, and students back here on Earth have been discussing the novel. 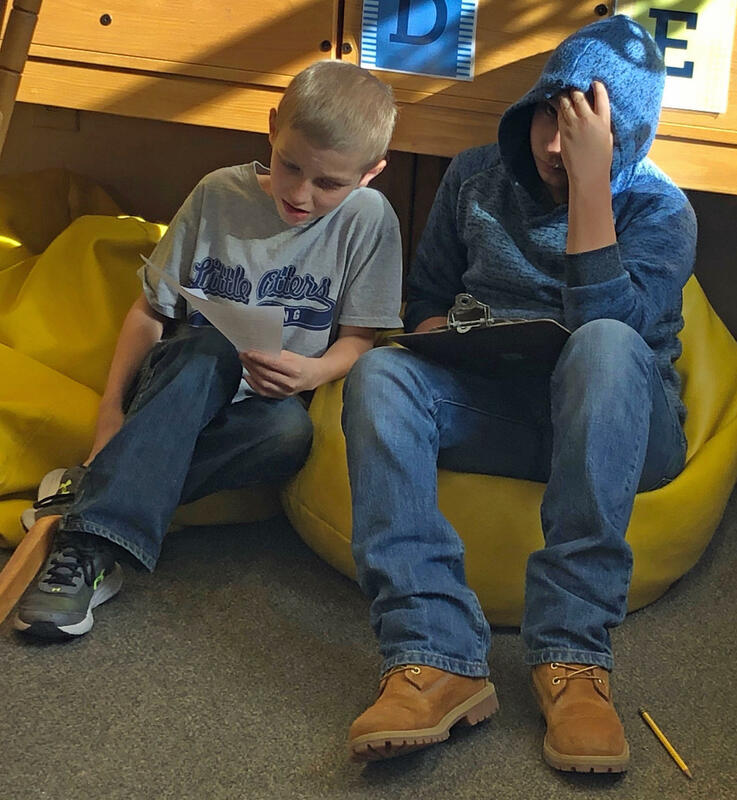 At Lothrop School, in Pittsford, a group of Dorothy's List readers contemplated what they’d miss if they had to leave their planet (trees was one of the big things the students said they would miss). 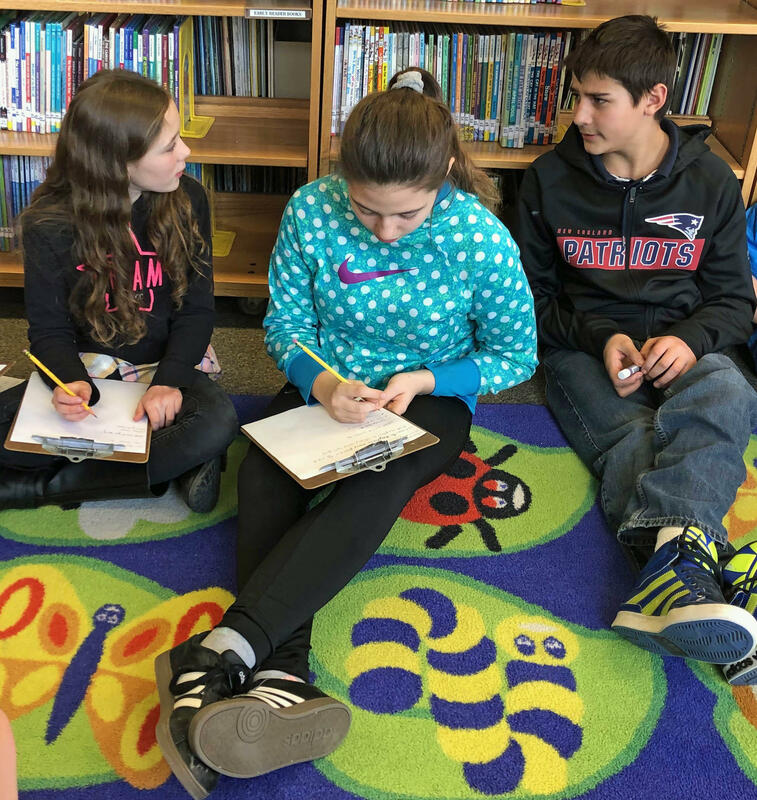 From left: Sara Loyzelle, Savanna Cook and Noel Pearsons sit together during an activity where students had to think about what they would miss about Earth if they had to go to another planet. Not only did they discuss that topic, but they also shared questions about Last Day on Mars for author Kevin Emerson. Blake Jackson: "What inspired you to write the book?" Kevin Emerson: "Well, I’ve always wanted to go to Mars, to be honest, and to travel in space. And that is looking less and less likely in my lifetime, but I think it might be possible in your lifetime." But, Emerson said, his main inspiration hits much closer to home. Kevin Emerson: "My big inspiration for the book really was … the theme of growing up and leaving home. And I sort of centered on the idea that my main character Liam has spent his life on Mars, and it’s kind of like moving to a new town — leaving his home and going to this new planet — except it’s much further than a new town because you can’t, you know, go visit your old house. And you can’t see the new house because it’s 100 years away. "And I just thought that was an intense emotional experience, and I moved from one town to another when I was about Liam’s age and I remember just having a lot of emotions about it. That was really what inspired me to come up with the rest of the story." One sixth-grader had a question about the novel's literal out-of-this-world setting. Mark Jackson: "Why did you choose to put the book on Mars and put in the details you added?" Kevin Emerson: "Mars is particularly fascinating because it is like Earth in many ways, so it almost seems like you could go and live there. But then, it’s different in a bunch of critical ways that make it very, very dangerous. And so, I really enjoyed imagining what it would take to live there and all the ... technology we would need and, you know, how surviving there would be so difficult. And I wanted that to feel very realistic." And Emerson said, as the trilogy progresses, his characters travel even father. They're headed to a new home on a planet called Aaru-5, on the other side of the galaxy. They hope it's a lot like Earth but, of course, no one has been there before. Kevin Emerson: "Ultimately, I wanted to write this story about my characters and humans getting further and further away from what is really our home, which is the planet Earth. Mars is like one step … and then … the further they get, things get more and more different than Earth." Listen to the audio at the top of the post to hear an excerpt from the book from when Liam and his family are leaving their apartment on Mars for the last time. 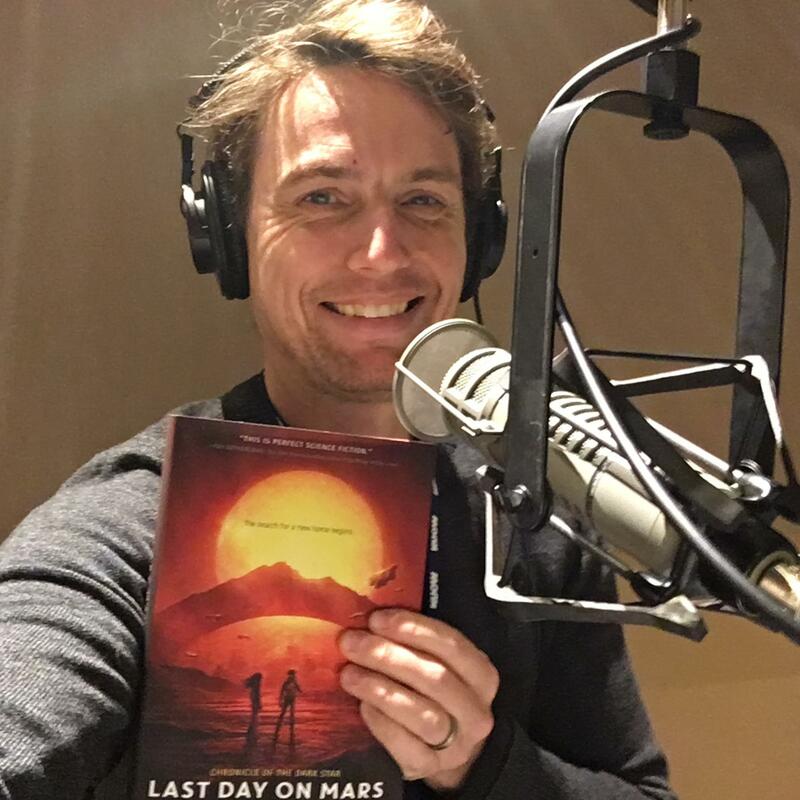 Author Kevin Emerson holds up his book "Last Day on Mars" while at KUOW in Seattle. Emerson was there to answer Lothrop School students' questions about the novel. Many students wondered about the time it took to write the novel. Another estimate was made by fifth-grader Samantha Davis: "A week." So how long did it actually take? Emerson said it took him a couple years to write the book, but it’s something he’s been thinking about for a really long time — since before some of these Lothrop students were born. Kevin Emerson: "I had been thinking about the beginning ideas of this story for almost 10 years. I have some notes on my computer that date all the way back to 2006, when I was thinking about how to come up with a story where I could have young people on a spaceship, on their own, far from home. That was really where I wanted to get to. And then, as I was thinking of how to set up a plot that would do that, you know one thing led to another, and I finally had this whole idea for Last Day on Mars. "And then I sat down to write it, and I wrote a first draft that was kind of almost right, but it needed some work. And then I wrote a second draft that was actually less right. It kind of went in some wrong directions. And I had to write a third draft that kind of corrected for what I’d been trying to do and fixed it all up. I did spend longer revising the book than I did writing the book. And so, all together about two years to get it right." One sixth-grader wanted to know about another aspect of the writing process. Randi Lancour: "Was there any research involved in writing the book?" Emerson said there were two big topics that he researched extensively. Kevin Emerson: "One was Mars and what it would take to live there, because I wanted that part of the story to feel very realistic. … None of us have ever been to Mars and yet I wanted you to feel like you were there. So, I tried to get those details about the environment and what living there would look like – I tried to get those to be as realistic as possible. "I actually did a lot of math … just thinking about distances and speed. It was more math than I expected to do. But those were the two parts that I wanted you to really feel like were real." A fifth-grade student wondered if Emerson did all that work on his own. From left: Nolan Tripp, Mark Jackson and Kaya Blaisdell work on an activity as part of a discussion about Kevin Emerson's sci-fi novel "Last Day on Earth." Kaya Blaisdell: "Do you have any other people working with you?" Emerson said he bounced a lot of ideas off his friends and family while we was researching and writing the book, plus he had a team of people helping him at Walden Pond Press. "Even though, you know, it’s just my name on the book and I did spend most of the time working totally by myself, I really did work with, like, a lot of different people in my life to make this book possible." A sixth-grader was curious why it was this particular story that Emerson chose to write. Savanna Cook: "What made you write about this book over any other idea you had?" Emerson said his editor actually picked it from a list of his ideas. "I always have a bunch of ideas, and I was like, ‘Which one do you like the best?’ … And he was like, ‘This one would be really cool because it kind of builds on your last book and no one’s really writing science fiction like this.’ … And then I thought about it a bit and really, really got excited about the idea." Jasper Kingsley, left, and Raul Alfonso Soto-Urdaneta sit together during the "Last Day on Mars" discussion at Lothrop School, in Pittsford. Our last question, from a fifth-grade student, brings us back to the premise of the trilogy: that the sun becomes a supernova and destroys our solar system. Sydney Stout: "Will the sun explode?" Kevin Emerson: "OK, this is a great question and your tone of voice suggests that it might be … sort of a freaky idea to you, which it is to me. ... As I was early coming up with this idea, the first time I told it to my kids, my son kind of had a very sort of freaked out response. He was like, ‘Our sun is gonna explode?’ And the answer is: No, our sun is not going to explode. In fact, it’s impossible for a star like our sun to go supernova. "So the entire premise of this book is based on the idea that something unnatural – something that we can’t understand about the universe – has happened to our sun. Someone or something has changed it. … The sun will run out of energy in about five or six billion years – that’s the best guess that we have. And at that point it’ll expand a bit and then die down to a white dwarf, but it’s not going to go supernova." But anything can happen in science fiction, and for Dorothy’s List readers who want to know what happens next for Liam and Phoebe, the second book in the Chronicle of the Dark Star series is called The Oceans Between Stars. The final book in the trilogy, The Shores Beyond Time, has just been released. Special thanks to Lothrop School library media specialist Christine Tate. Next month we’re reading Beyond the Bright Sea by Newbery Honor author Lauren Wolk. Ask your librarian for a copy so you can read along. Find all the Dorothy's List episodes here.